Today I’m going to show you the three steps to getting your California Guard Card the FASTEST, EASIEST way possible! As a security training authority, my mission is to create dedicated security professionals that are committed to create safe communities. I do this by teaching you to get our California Guard Card and become a security officer the fastest and easiest way possible! If you have a heart for your community and a desire to keep people safe then I’m here to help you! 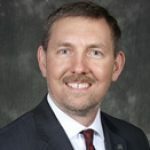 Taking the time to learn these tips really symbolizes your commitment to being the best security officer you can possibly be so I congratulate you! Taking these steps shows you’re willing to do what it takes to protect those that you serve. I’ve been enlisted in the United State Marine Corps, protected movie stars, founded a successful, award winning private security company and have been training security officers for almost 30 years. 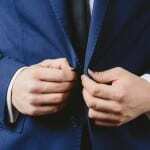 I’m proud to say that that my success and insider information can be used by YOU to create your own success in the security industry. I have a Iot to teach and I’m eager to share it so look for the links where you can get even more from me! 8 hours of training must be completed prior to working as a security officer. This is called the “POWERS TO ARREST” and the “WEAPONS OF MASS DESTRUCTION” courses. Once you start working as a security officer you have thirty days to complete another 16 hours of training. The next block of training is not required until you’ve been working as a security officer for 6 months. That’s when you’re required to complete your final 16 hours of security training. 8 hours of training pre-employment. 16 hours of training in your first month working as a security officer. 16 hours of training before you complete 6 months working as a security officer. This adds up to a total of 40 hours of required training for all California security officers. You are allowed to receive your training either online or in person but the fastest, easiest way to get this training is online here. Once you’ve completed your training the next step is to be finger printed. Make sure to go to a “LIVESCAN” facility to get this done. Do NOT get fingerprints with ink and paper because this will seriously slow down your approval process. There are many places to go to get a LIVESCAN done so just find a place that’s convenient for you. We also offer the LIVESCAN fingerprinting service so check out our website for details. Once you’ve submitted your LIVESCAN fingerprints you’re ready for the last step: submitting your application. Every so often the website for this changes so here is the correct link. Your guard card is issued by the California Department of Consumer Affairs, Bureau of Security and Investigative Services, or “BSIS” for short. 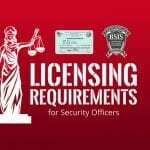 BSIS is the State agency that licenses, registers and monitors the security industry in California. ONLY submit your application online – doing it by mail will slow down your approval. Make sure there are NO typo’s! If you have one error it could slow down the whole process. For women; make sure the name on your application & your LIVESCAN form are EXACTLY the same. If you were married and had a name change this can slow down the process. Make sure to have your “ATI Number” handy. This is the number at the bottom of your LIVESCAN form. This number allows BSIS to connect your guard card application to your LIVESCAN submission. Entering this number incorrectly will slow down your approval. Once you’ve completed your application online and paid your fees you can go back to the BSIS website after a few days to see if you’ve been approved. Once your guard card is approved it will show up on the BSIS website as a valid guard card. If you don’t see your guard card on the website right away then don’t worry about it, just keep checking back every couple days. If you still don’t see it after a couple weeks then pick up the phone and contact BSIS or send them an email, but be prepared for a delay before you actually talk to anyone. When your guard card is approved and shows up as valid on the BSIS website, print out a copy of the web page and keep it with you when you work. Once your guard card arrives in the mail you don’t need to carry the printout any longer. You are required to always have either the print out or the actual guard card with you at all times when working as a security officer. That’s how you get your California guard card the FAST and EASY way! Take the Powers to Arrest and Weapons of Mass Destruction courses. Once your guard card is approved, you’re off and running and ready to start your career as a security officer! If you’re eager to get started right away then click the link below to learn more about the Fastest and Easiest way to get your California security officer training. If you’re not ready to get your training done today that’s OK, just stay with us! Like, subscribe and follow us because we’ll have more great insider tips & tricks coming soon and you don’t want to miss anything important! What is a guard card and do I really need one? What can prevent you from getting your Guard Card? 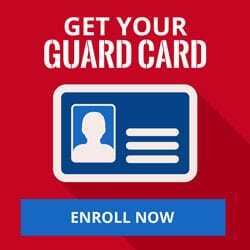 What are the training requirements AFTER you have your guard card? 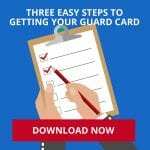 Tips for speeding up your guard card approval. Some of the questions on a guard card final exam! Stay with us for all of these answers and more! But right now I encourage you to apply what you learned today. Go to our website and register for the course. RIGHT NOW is the best time for you to take what you’ve learned and put it to good use while it’s still fresh in your mind! So follow the link and get started NOW! I look forward to seeing you get trained soon!